"Look, you work your side of the street and I'll work mine." Steve McQueen is one of the first names that comes to mind when we hear the phrase "Hollywood legend." Up there with the likes of Clark Gable and Cary Grant, McQueen was the actor in the 1960s. However, the "legend" that McQueen most draws comparisons to is the late James Dean. Both men literally loved to live life in the fast lane, especially McQueen, who owned and rode motorcycles and speedy, fancy cars. Steve McQueen took his love for cars and just plain wildness to the next level by almost always performing his own stunts in his films. Movie producers didn't exactly like his insistence on putting his life at risk during shooting, but this resulted in a finished product that was much more genuine than those in which it is obvious that the movie's star isn't performing the daring deeds. Unlike Dean, Steve McQueen's early death (he was only 50) wasn't the direct result of his wild personal life. While Dean died in a car accident, McQueen died of lung cancer, the form of which could have been caused by exposure to the asbestos that was in his race car safety suits. Then again, McQueen spent time in the Marines, and could have been exposed to the harmful material then. While Dean's death was pretty cut and dried, McQueen's death remains somewhat mysterious, relegating both legends as cult icons as well. Arguably the actor's largest success and most memorable film, Bullitt was unleashed in theaters in 1968, giving birth to the term "gritty cop drama," which is thrown around a lot these days. Steve McQueen stars as Frank Bullitt, a no-nonsense San Francisco cop who has been assigned to guard mafia informant Johnny Ross. Frank is leery of his assignment since shady politician Walter Chalmers was the assignee. Frank realizes that it is his duty to follow orders, but that doesn't mean that he won't be careful about who to trust. This wonderfully exciting, true classic of a film is best known for the car chase sequence that occurs near its halfway point. With McQueen behind the wheel during this exhilarating sequence, he soars through the hills of San Francisco, pursued by gangsters. The editing and Peter Yates' direction here is topnotch, ranking up there with the best of film lore's chase sequences, including the one in The French Connection. The events surrounding the big chase scene are quite compelling as well, featuring a career-making performance by McQueen, and great work from Robert Vaughn, Robert Duvall, and Jacqueline Bisset. This is a tight action-packed thriller that will have you rooting for one of Hollywood's true heroes the whole way. Revisiting this classic film today brings about the obvious comparison between Steve McQueen and Clint Eastwood, and, more specifically, between Bullitt and Dirty Harry. Both projects were huge successes for their star actors, almost singlehandedly making them Hollywood icons. The comparisons don't stop there, as the titular characters are both gruff, hard-nosed cops who aren't afraid to bend the rules. While Eastwood has made countless films and is now one of our most talented directors (Mystic River and Million Dollar Baby), McQueen died far too young and never had the chance to compile as large a filmography. Still, quality being much more important than quantity, and McQueen's career is untouchable. Image Transfer Review: This new digital transfer appears in a 1.85:1 anamorphic widescreen format. Bullitt has never looked better, with the clean-up process producing image detail that I thought I'd never see for this old film. The darker sequences still suffer from quite a bit of grain and dirt, but the bright, sunny outdoor scenes are a joy to behold, with incredibly accurate fleshtones, and well-rendered colors a constant. Audio Transfer Review: The Dolby Digital 2.0 audio is quite nice as well, with a surprising amount of directionality in play. The surround activity gives us much more than we would expect from a 1968 film, especially during the big chase scene. As Bullitt's car flies through the streets of San Francisco, the sound of the car travels between the appropriate speakers, with just the right amount of solid bass to add a bit of kick to the proceedings. Extras Review: The extras in this two-disc set do a great job of chronicling Steve McQueen's legendary career, focusing on Bullitt primarily. The first disc has the film's trailer and an audio commentary track with director Peter Yates. This track is fairly extensive, with Yates spending much of the time reminiscing about McQueen, but just enough time on the technical aspects of his film. There are a pair of feature-length, new documentaries on Disc 2, beginning with Steve McQueen: The Essence of Cool, which runs for nearly an hour and a half. This is a remarkable chronicle of McQueen's film career, interspersing film footage and interviews with actors and filmmakers who worked directly with him (Robert Vaughn) or were greatly influenced by him in their own careers (Alec Baldwin). The Cutting Edge: The Magic of Movie Editing is a breathtaking 100-minute piece about what goes into editing a film. What makes this so entertaining is the amount and variety of new film footage that is used in the piece, as well as the collection of industry people who discuss just how important editing is. Narrated by Kathy Bates, this piece features the likes of Jodie Foster, Sean Penn, and Martin Scorcese among many others. This is a true bonus feature because it could easily have been sold on a separate DVD. An old 10-minute featurette called Bullitt: Steve McQueen's Commitment to Reality is another treat, as it compiles a series of on-set footage. It is rare for such old footage to exist, let alone be presented on a DVD. 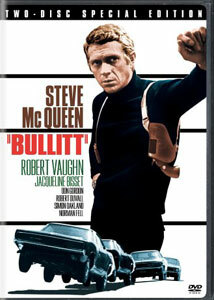 Bullitt is a true film classic, and it's great to see Warner Home Video finally give it its due on DVD. This glorious two-disc set features a gorgeous, new video transfer, solid audio, and a collection of extras that include two of the better documentaries to ever be included on a special edition DVD.